Winter is in full swing at River Legacy and plants and animals have to adapt to the changing season. Winters tend to be mild in North Texas but temperatures still drop to freezing and below, as it has been the case for a few days in the past couple of weeks. How do the animals and plants survive the cold? It turns out that many species have unique adaptations that allow them to survive the harsh conditions of this season. Let us take plants, for example. Annuals, plants that live for only one growing season (usually spring to fall), survive the winter as seeds in the soil. The soil tends to be warmer than the surface, which allows for the seeds to survive. Perennials, plants that live year after year, survive in a different manner. They can go into a state of dormancy (trees losing their leaves, for example), which is akin to mammal hibernation. In addition, if it gets too cold, some plants can produce chemical substances that lower the freezing point of the fluid inside their cells and in between their cells, so that ice crystals do not form and kill the plant from the inside. Animals too have to cope with the freezing and sub-freezing temperatures. Some mammals hibernate, meaning they basically shut down for the entirety of winter and sleep in a warm place. Others can find a nice den and stay there most of the time for the coldest part of the winter. Fox squirrels (Sciurus niger), a very iconic River Legacy mammal, will build dreys and also share their dens with other squirrels to keep each other warm. They also prepare in advance by increasing their food consumption and caching in the fall so that they have enough from which to survive in the winter. Reptiles, being cold-blooded, cannot survive drastic drops in temperature so they find a warm shelter and go into a state similar to hibernation called brumation. The difference is that reptiles can wake up from this state if a warm winter day happens to arrive. Aquatic reptiles and fish will hang out at the bottom of their habitat (creek, pond, river, etc. ), where it is warmer and slow down their metabolism. Birds will either migrate, hunker down, get together in groups, shiver to increase body temperature, and cover their feet with their downy feathers when sitting down. 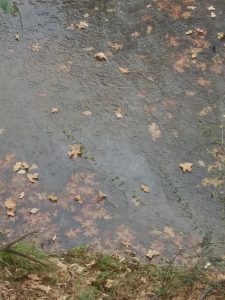 Next time you use the walking trails at River Legacy when it is cold, think about the animals and plants all around and their incredible adaptations that enable them to survive! 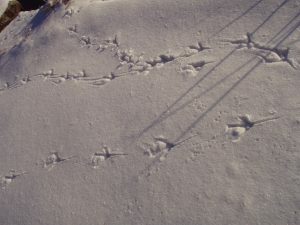 Animal tracks in snow from a couple of years ago at River Legacy Living Science Center. ← Bird winter migration is here!